For years he's battled the seven deadly sins as comics ultimate wish fulfilment super-hero, but his return to the new DC52 will see Captain Marvel navigate the most sin inducing waters of all, the complete relaunch of a comic book icon. 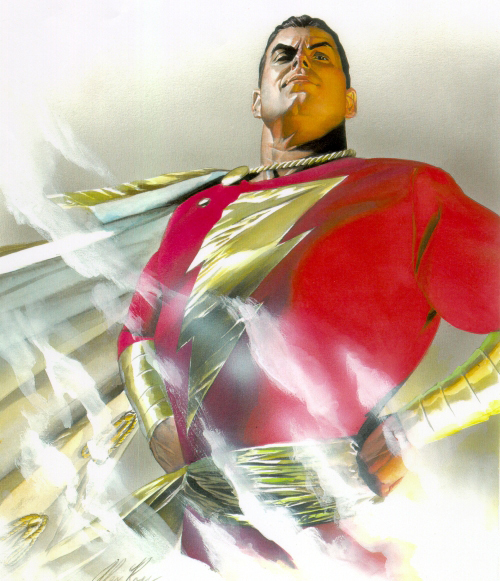 Already charted as part of the voyage, Billy Batson's alter ego will get a new costume and change his name. 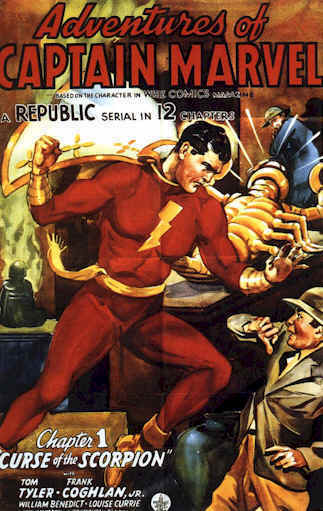 Goodbye awkward copyright issues, hello Shazam! Written by Geoff 'If anyone can revamp an icon it's me' Johns, with art by Action Comics former whiz kid Gary Frank, the magical makeover that promises to expand the scope of the already expansive backdrop to 'the World's Mightiest Mortal' starts in a 10 page back-up strip titled The Curse of SHAZAM!, kicking off in Justice League #7 this March. Aside from Alex Ross, who did the above painting and is probably sweating bullets at the idea as we speak, no one has done more to keep Cap in the fan spotlight these last few years then Johns. Geoff wrote a killer version of both Captain Marvel and his arch nemesis Black Adam in the pages of JSA, and hopefully this reboot of a 1940's favourite is a lightning rod for that same kind of magic. While changing the name of a character that also promotes your main opposition makes corporate sense - I mean Coca-Cola's not about to produce Coca-Pepsi anytime soon - based on the exclusive preview art over at Newsarama, DC Entertainment seem to be going to lengths to differentiate Billy from parent company Warner Bros' last magical miniature money maker, Harry Potter. Batson is now light haired and the train which originally took him to his new home of sorts, the Rock of Eternity, has seemingly been replaced by an elevator. What class will the Hogwarts hat of fandom put the revamp into when all is said and done? It is way to early to tell. While I would've bet the farm DC was looking at Earth 2 for the big red, it's just good to see him back and getting some serious exposure in the process. DC's mythologically based super-heroes have always held the top spots for me and I'm hopeful these short strips can raise Batson's grades to the levels the mythbusting and equally iconic Aquaman and Wonder Woman currently enjoy. Now if they could just make Billy's physique altering catch-cry 'Shazam!' as transformative in the real world as it is in the fictional, I'd be one happy camper. "SHAZAM!" Nope, hasn't happened yet. *Sigh* One more title to add to my pull-list. Leave my poor wallet alone, DC! Though it'll be worth it, especially if they give Mary Marvel a similar reboot and erase all trace of the atrocities they've inflicted upon her these last few years. As crazy as it may seem Pensol, this saved Justice Ldagues spot on mine. I was going to give it up for the JSAs return, but that all changes now. Hopefully a solo series follows! I´m actually thinking of reading this one :) I never got the Captain Marvel family history. Maybe a new start is the place for me to start reading. Nice one Aliera - if you do it would be good to hear your thoughts. Captain Marvel, err Shazam I always thought of as a great new entry character for any fan of good fun comics, with a bit of mythology and magic thrown in. I too didn't always get the Marvel Family thing, but if you think of it from the non-super-powered angle it clicks. Billy Batson is pretty much an orphan. The others gifted the powers of Zeus etc by the Wizard Shazam, become his surrogate family - the only real one he knows. He gets to be Earth's mightiest mortal with an instant family - for a lonely kid, that's some wish fulfilment! Thanks Craig, Im hoping the costume is a bit more in the tweak category, but who knows, with all the Watchmen buzz DC might just be going fore broke. It was stupif of them changing his name to just "Shazam". It just feels meaningless without his real name - CAPTAIN MARVEL! Hey Anthony - I agree on the name change! Maybe if this Earth has an Earth 2 they'll bring back the old as an Earth 3. Then the fans would show which was the more preferred!